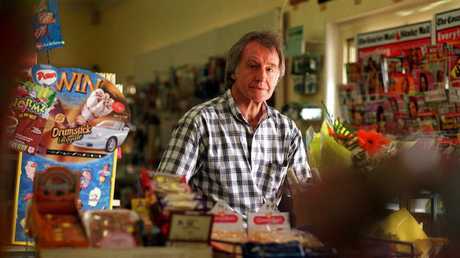 Ron Grant in his Bellmere convenience store. QUEENSLAND sporting great Ron Grant was the first person to run around Australia and now he faces an even bigger challenge with a supermarket chain set to send him broke. For more than two decades, the retired athlete and his wife Anne have been the friendly faces and owners of Bellmere Convenience store west of Caboolture. Their small but well stocked shop sits within Bellmere Shopping Centre on Bellmere Rd and is complemented by a bakery, a cafe, a butchers and a takeaway food outlet. The site of a proposed Woolworths and 7 Eleven development north of Brisbane. An Aldi supermarket took a chunk of the Grants' takings when it opened a couple of kilometres down the road a year ago. They're expecting another hit when a 7-Eleven, with a service station, which has been approved on a site diagonally opposite the centre, eventually opens. 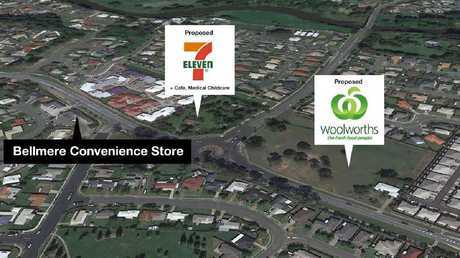 Construction on the service station will start before Christmas, but the bigger concern for the Grants and other local businesses is that Woolworths intends to develop on a vacant block opposite 7-Eleven. 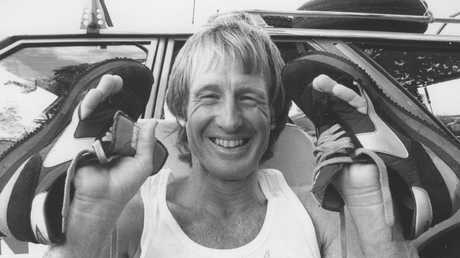 Ron Grant was Queenslander of the Year in 1984 after running around Australia the year before. "Even the 7-Eleven has a bigger footprint than this shop," Anne Grant told The Courier-Mail. "If Woolworths goes ahead it will send us broke." Ron Grant, who was Queenslander of the Year in 1984, only works in the store one day a week. He ran around Australia in 1983. He started in Brisbane and covered more than 13,800km by the time he arrived home 217 days later. Ms Grant said her husband did not want to talk about the future and what it held if Woolworths went ahead on the southwest corner of Bellmere Rd and River Drive. She said the Moreton Bay Regional Council had said it had done its best to dissuade Woolworths after it lodged an application to develop the site. The plans included a BWS and specialty stores, but the application was withdrawn in July last year. "I don't know if you can stop it. I think businesses like Woolworths don't really care unless there are something in the regulations to stop them," she said. "That corner is not deemed a neighbourhood hub and Bellmere is not ready to have a Woolworths." Bellmere Bakery owner Matthew Ewing had little faith in council preventing the development. "If it's going to happen, it will happen and I'm of the opinion that if people like quality bakery bread, that's what they will buy and not Woolworths' bread," he said. Woolworths' in-house property division Fabcott Pty Ltd bought the 1.97 hectare site in 2014 for $2.53 million. 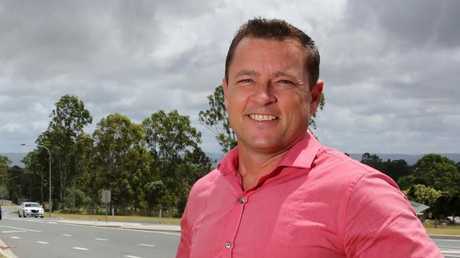 Councillor Adam Hain says while the service station will save residents a trip into Caboolture or Morayfield, the supermarket could have an impact on other local businesses. A company spokeswoman said Woolworths was committed to the development. "The Woolworths-owned site remains an active and positive opportunity and we will be revising our DA with the intention to lodge in the short to midterm," she said. Local councillor Adam Hain said everything had been done to protect the interests of residents and business but was unsure how long they could hold out. He said the service station would save residents travelling to Morayfield or into Caboolture for petrol but conceded a Woolworths would have an impact local retailers. "We pushed back hard against Woolies going in there and they've gone quiet and probably will land bank it for 10 years until the area grows more," he said. "We can only fight the fight for so long or as long as we can justify it."